Above: Randy Pobst driving the GT2 RS at Road Atlanta. Porsche’s 911 GT2 RS has been setting production car lap records at several tracks around the globe, both officially by Porsche and by parties that have managed to get their hands on the 700-horsepower 911 (including Porsche Panorama). 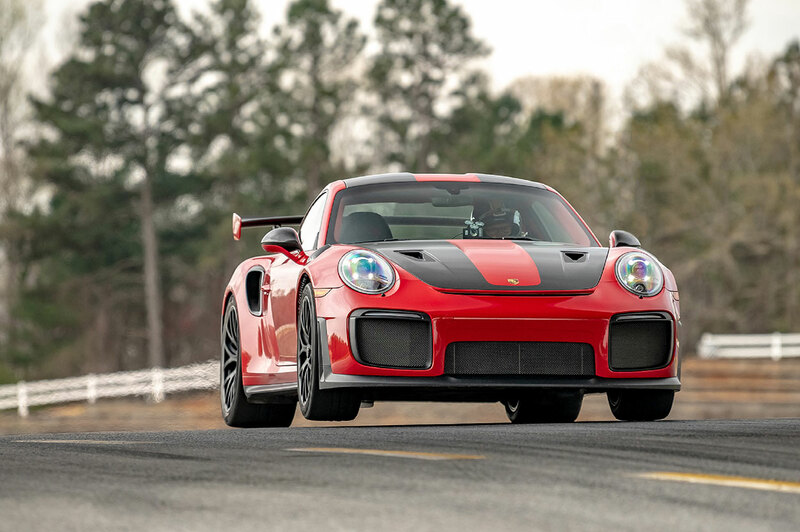 The automaker announced today that the GT2 RS now holds the production car lap record at Road Alanta, with professional race car driver Randy Pobst rounding the 2.54-mile course in 1:24.88 minutes. Porsche brought professional hot-shoe David Donohue as well, and he and Pobst took turns behind the wheel of the Porsche. Watch the video of Pobst setting the record below. Now that you’re done watching the GT2 RS, here’s a bit of context. In 2018, Chevrolet took its 755-hp Corvette ZR1 to Road Atlanta and managed a 1:26.45 with the same driver at the wheel. The ZR1 looks insanely fast, but also much more of a handful than the GT2 RS. Perhaps proving the point that Porsche’s GT cars are easier to handle and punch above their weight, Porsche also timed laps of its GT3 RS, with 520 hp, and was able to achieve a 1:26.24 at Road Atlanta, just hundredths of a second faster than the ZR1. Above: GT3 RS at Road Atlanta. "It was an incredible experience. The traction coming out of a corner, the tireless brakes, the grip generated by the downforce and the tires, and of course the tremendous power made it possible. The 911 GT2 RS is not just very capable, but also very approachable," said Donohue. "Even for a professional driver, huge power can be intimidating. But when I drive the GT2 RS, the massive torque feels completely under my control, so useable, because the car is extremely well-balanced. It is very confidence inspiring, a pleasure," added Pobst.